What's your idea of a perfect RV Resort experience? A spot overlooking a lake? Watching a sunset with new friends? At Premier RV Resorts we can help you create memorable experiences. We are committed to making your visit perfect with a true resort experience with concierge guidance on local activities and fun hospitality events. 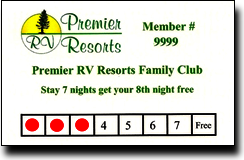 Premier RV Resorts was founded in 2000 by acquiring a park in Redding and renovating it. We quickly became ranked as one of the nation's top 25 RV parks, which encouraged us to expand to five locations. Experience best-in-industry hospitality at a Premier RV Resort in Redding, California, in Eugene, Salem, or Lincoln City, Oregon or in Clarkston, Washington.